Things I’ve picked up over the last month. This isn’t to say I’m right; just where I am right now in my healing. ~ Let people speak and chime in when you can be truly helpful. The rest is ego play. Most conversations I experience (myself included) are two or more people with a single goal of saying what they feel they need to say regardless of where it takes the conversation. ~Having an opinion is always a waste of energy. I’ve been particularly judgmental of a certain person recently, convinced that my opinion was justified. After giving heaping spoonfuls of my “advice” and criticism, I’m right back to realizing that what I should have done was love and accept as always. I pray for forgiveness in this area. The Course says that it is impossible for us to make an accurate judgment unless we know every detail about everything, past, present, and future (which is also impossible!) We all express opinions daily and may even be required to, but I know that deep down an opinion has no ground. ~Jesus calls us to maintain that little spark in our consciousness at all times. The daily lessons are a practice of mind discipline for achieving this. We learn to step back, look at our thoughts, and choose a course of action that increases love. He asks us to merely keep a spark of Christ consciousness in our minds and let Him do the rest. This is a seemingly small request yet we need A Course in Miracles just to get to that point. May we all move a little of the clutter in our minds out of the way to make a place for Jesus to get comfy and guide. And what is our prize? Real, lasting joy! ~I recently read Doug Thompson’s article in the CMC Ezine which brings up the tired subject of right and wrong interpretations of the Course (which he has found it in his heart to forgive us for). It included a few opinions which brought up opinions of my own. Yet, I took a step back and looked at what I loved about it. When I started reading the Course, I had to re-read parts. In doing so I would be amazed at the beautiful command of language. It reminded me of how I would read Shakespeare in high school. Well, Doug says the following in his article: “At the very least, ACIM as the longest work of iambic pentameter poetry ever composed in any language should attract interest from literature departments. Regardless of its content, its FORM is unprecedented in human literary history. Jesus embraces Shakespeare and then dances circles around him.” This paragraph gave me goose bumps. ~It seems like some of the most out-spoken people are generally some of the most fearful. ~The truth will weather and correct all errors. Sit back and let it unfold. ~I’ve discovered that I want to dive deeper into my spiritual practice but I have a fear of losing my identity. I see the error now (thanks to ACIM) and am asking for guidance. 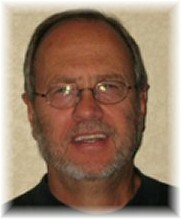 *Daniel Tipton resides in Omaha, NE and is a member of the Course in Miracles Society study group. He is enrolled in the ACIM Ministerial Program offered by the Community Miracles Center and attended the 2011 Annual ACIM Conference in San Francisco. “Read it again, Mama,” my then two-year-old daughter would chant night after night at bedtime. And regardless of how tired I was, I would start over, vaguely conscious even then that my own little bunny would all too soon be running away as all little bunnies eventually do. “Once there was a little bunny who wanted to run away,” I read. “So he said to his mother, ‘I am running away,’” my daughter would chime in. She loved that part. Like most young children, my daughter loved this tale by Margaret Wise Brown concerning a little bunny’s fantasies about striking off on its own, assuming various identities and hell-bent at trading the security of a safe, toasty warren and a parent’s adoration for more alluring horizons. Becoming for example a fish in a trout stream that tries to swim away only to have its mother come after him and fish him out with a pole. My daughter would clap her small hands as the little bunny became a rock on a mountain, a crocus in a garden, a circus performer, and a sailboat in its frenzy for freedom and laugh as the patiently indulgent mother followed in hot pursuit, morphing into a mountain climber, a gardener, a trapeze artist, and a steady wind to blow him back into her loving fold. “Read it again, Mama,” my daughter would command each time I attempted to close the book. Because, in truth, she liked the descriptions of the bunny’s adventures and the Mama’s chase much more than the ending where the bunny gives up and comes home. She has always been like this. In daycare, instead of clinging and pitching fits like normal children, she would wiggle down off my hip and toddle bravely off toward the playroom calling out names and dispensing hugs like a politician working a fundraiser. I would stand watching as the other parents labored to pry their writhing, wailing spawn from their calves, trying to convince myself that this was a good thing. I had raised a confident child. Still, it was all I could do to resist casting a line and reeling her back in. Fast forward 16 years and my daughter is mentally and emotionally preparing to leave the family den without so much as a backward glance as all brave bunnies eventually will. Chomping at the bit to forge a new, improved, and more exciting life for herself. I am acutely aware–as we begin her final semester in high school and final varsity soccer season; as we start filling out graduation announcements and planning a celebration for family and friends–that my days as a live-in parent are numbered. As she studies for her final IB exams and weighs final college offers, I am also conscious that the story of The Runaway Bunny is everyone’s story, a story of taking the “tiny mad idea” that we could flee our Father’s all-encompassing, eternal Love and play hide and seek with him in a hallucinated world of which he—remaining thankfully, unalterably sane–knows nothing. I’m OK with this, I tell myself as I set about whipping up another comfort food classic—macaroni and cheese and tuna noodle casserole and my famous spicy turkey meatloaf—she is, ironically, rarely around long enough anymore to eat. I know I am really trying to assuage my own persistent sense of loss. A nagging regret that defies my growing faith in what A Course in Miracles is saying. Its take on the nature of our closest relationships and the enduring specialness of this specific relationship in particular I still think I want more than the perfect, all-inclusive Love all the seeming fragments of the one child of God continue to pretend to push away. Then, too, I catch myself watching my daughter sometimes with a deep sense of longing, wishing I could impart what I am learning in A Course in Miracles about our universal authority problem, the ego’s journey into an invented world wherein it continually seeks but never finds itself. A reenactment of the original journey away from the mind we embarked on when we forgot to laugh at the thought of separating from our creator, choosing instead to follow the ego away from the one mind and then forget we ever had a mind. Assuming bodies–intent on competing both for survival and divine attention and approval–and forging deeper and deeper into a dream of self-imposed exile from perfect, eternal, all-inclusive Love. Cutting deals with others to get our needs met that never work for long enough while continuing to try to entice the ego’s God to follow us into this world and validate our illusions. But I know we cannot fix or change or spare any of the inhabitants of this world what the Course calls their “curriculum,” not even the ones we literally bring into it. This comes as a particular affront to parents and yet, we can only choose love over fear whenever an opportunity to do so presents itself. We can only choose for the inner teacher of love; thereby teaching love; the inner teacher of invulnerable strength; thereby teaching invulnerable strength. On the level of form, I find myself grieving what still sometimes feels like my daughter’s impending defection, even as I recognize the time has come for her to give this world’s illusions her best shot. We have outgrown my long fantasized ability to protect and control her and I realize that the faster she experiences all the world has to offer, the more quickly she will learn to resign as her own teacher as we all must eventually do. Still, a part of me wishes I could somehow intervene, somehow spare her the time and disillusionment that eventually propels us to finally plead for a better way. Sometimes I still wish I could just convince my daughter to accept the ending to The Runaway Bunny, wherein the little bunny realizes it might just as well stay put and reap the benefits of maternal nurturing and the mother rewards him with a big, fat carrot. But I know too much about how this dream works now. Besides, that would require me to accept it myself and I am not quite there yet, still invested in this world at least when it comes to the fate of my little bunny as I swallow another spoon of baked mashed potatoes in her behalf and wait with my little dog for my daughter to come home. *Susan Dugan is an A Course in Miracles student and teacher blogging about practicing ACIM’s extraordinary forgiveness at www.foraysinforgiveness.com. 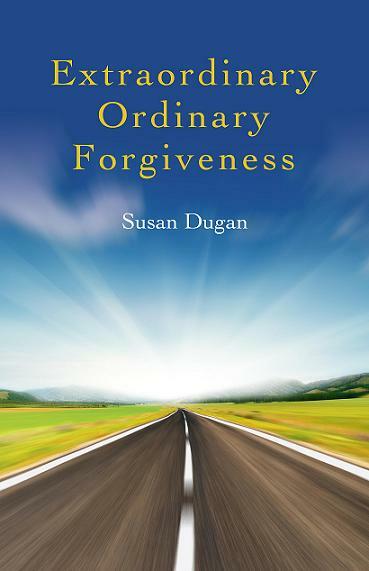 Her collection of personal forgiveness essays, Extraordinary Ordinary Forgiveness was recently published by O-Books and is now available on Amazon http://www.amazon.com/Extraordinary-Ordinary-Forgiveness-Susan-Dugan/dp/1846945585. She appears in the documentary A Course in Miracles: The Movie along with premier Course Scholar and Teacher Kenneth Wapnick, PhD, best-selling Course Author Gary Renard, and Nouk Sanchez and Tomas Vieira, Take Me To Truth: Undoing the Ego. As a singer/songwriter, I’ve always viewed song lyrics as a form of poetry- poetry that has the potential to touch people’s heart-felt feelings and emotions, with the help of a melody, voice and instruments. Here is my poetic collection of song lyrics to accompany my inspirational memoir Still Singing, Somehow. For those who have read my personal odyssey, these lyrics will add another dimension, and much insight, into many of the various stories and personal feelings expressed in the book. To me, songs are like seed versions of much longer stories, but loaded with deep emotions that simply can’t be expressed in mire words alone. That is where the voice comes in. Of all instruments, the human voice has always been the original one. Pathos in a human voice can often hit a nerve; when coupled with good lyrics, this power can be awesome. Some songs have the power to bring on an emotional release. Many of my songs did that for me. With that introduction, here is my near thirty year collection of poems, or song lyrics, written from the heart and soul. Blessings to all. 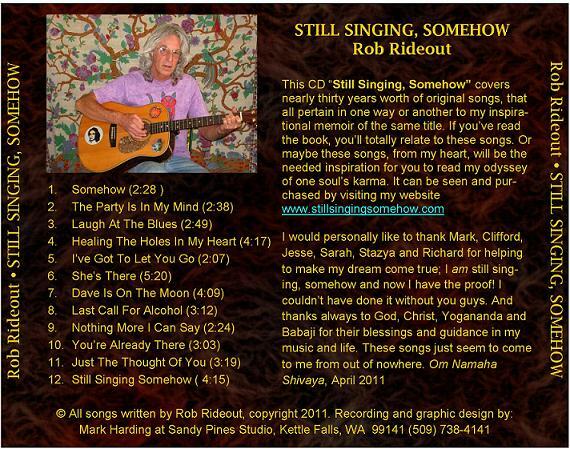 AND ~ Here is one of my songs off my CD that was inspired by ACIM, obviuosly! It’s called [“YOU’RE ALREADY THERE”]. Here is one more ACIM inspired song I think you’ll like. And here too is the last song, my title song that I want to stay in your head for awhile. The goal of forgiveness is to realize that there is nothing to forgive. That goal is stated quite eloquently in one of the most articulate and persuasive books ever produced in the English language, the revolutionary spiritual teaching of A Course in Miracles. I have studied this divine curriculum on a daily basis ever since the first time I picked it up, almost twenty years ago. That teaching, studied so diligently and absorbedly, changed my life in unimaginable ways and led me away from an egocentric, self-absorbed existence to a life now filled with blessings. That long and inspired journey taught me forgiveness, which opened my mind to the infinite possibility of a life existing alongside the delusional and ego-ruled existence that we know as “the world”. I came to see that divine possibility as an ever-existing reality which lives just outside our perceptual boundaries, yet knows no peer or even comparative examples in an inherently-limited, perceptual world. If I may, I will borrow a few minutes from your day to tell you of my adventure and the treasures found in its pursuit. I received a copy of A Course in Miracles from my wife shortly after the death of my mother. At that time, I had no idea of what it was about (neither did she) and certainly no forewarning of how much it would eventually impact my life. I have always had an inquiring mind, especially when it comes to matters of mind and spirit and that inquisitiveness, accompanied by a deep inner connection, compelled me to study this strange new book. Within a few minutes of my initial reading, I knew I held something very special in my hands. Having always possessed a preference for anything out of the ordinary, the book quickly grabbed my attention and I proceeded to delve into it with an open mind. Despite my proclivity for the unusual, I am also a very pragmatic, results-oriented person and surprisingly the Course appealed to those leanings as well. What I discovered was an articulate (even poetic) curriculum for seeing the world as we know it in an entirely new light, one that left me both hopeful and spiritually enlivened. It is an intelligent and insightful view of both the frailties of this world and the reality of the divine realm. Better yet, it gives very precise instruction for dealing effectively with the former and for discovering the truth of the latter. Unlike many spiritual practices, it deals not only with spiritual concerns but also with the part of the mind which drives our ego-centric lives as well as the part capable of unveiling and living in the unified Mind of the Divine. An essential component of the practice of Course precepts is forgiveness, as mentioned previously. The big difference however is the way the Course defines the term. Unlike the traditional perception of forgiveness as pardoning someone for wronging us, the Course prescribes forgiveness as a means for eliminating the barriers created by the guilt and fear driven ego mind and thereby revealing to us our true spiritual nature. It does so by providing compelling arguments that we should forgive not because someone has wronged us but rather because, in truth, the “wronging” only occurred in an illusory state of mind, or dream. As radical as it may seem, this revolutionary worldview has been proposed and endorsed by such great historical minds such as Plato, William James, Albert Einstein, and Carl Jung, as well as contemporary luminaries such as Eckhart Tolle, Marianne Williamson, and Dr. Wayne Dyer. The Buddha himself taught that most of us live our lives in a dream state and that our main goal in life ought to be to awaken from it to the reality of our divine nature. Jesus of Nazareth spoke of his “Father’s House” and the many wonders of the divine world as his truth. The good news is that we can awaken from the illusory dream of a perceptual-based world created by an ego-ruled mind and live our lives in a more enlightened way. That way is the path of forgiveness and of A Course in Miracles. In order to provide an example of how forgiveness works in the material world, I offer a story from my own life. Many years ago, shortly after my wife and I married, she began to experience dreams in which I was unfaithful to our marriage vows. Although she readily admitted there was no basis for suspicion or the dreams, she continued to have them. Having studied dreams for many years, I understood that they were simply revealing to her aspects of her subconscious that had nothing to do with reality. Yet the dreams seemed so real to her that upon awakening, she was actually angry at me for some time until it completely dawned on her that she had been dreaming. This is much like what we all experience in dreaming at times and points out how “real” our lives can appear to us, even in a dream state. It is only upon “awakening” that we realize that we have been dreaming and have finally returned to the real world. I remember similar experiences during the sixties as I experimented with hallucinogenics. The state of mind induced by those drugs convinced me, while under their influence, that my altered state of mind was, in fact, my reality. I was so convinced of it that I did some pretty stupid things. Unlike some others, I did not go as far as to believe I could fly and leap from an upper level balcony, but I suspect that was due more to good providence than good sense. All of these experiences, including my wife’s dreams, convinced me that our sense of reality is very much conditioned by our state of mind and, that in a perception-based existence, our reality is not only limited but distorted as well. Once we accept that premise, it is but a very short leap to consider the world as we perceive it as misrepresented at best and illusory at worst. My years of study of the Course and subsequent experiences in the world have only served to confirm that belief and to further convince me of the unsatisfying and false view of reality the material world presents. Though it may seem that we have traveled a tangent here in search of an answer, we have not. For the basis of forgiveness as I have described it here is predicated on the fact that we judge, condemn, and even crucify ourselves and others based on behavior and performance in a world built on illusion. Having said that, should we not forgive ourselves for something we never, in truth, did? Should we not reconsider our allegiance to a world built on such a fragile foundation? And would not a good starting point for that reevaluation be letting go of any judgments or resentment based on what may or may not have actually happened? Any reaction to an event is based on the assumption that what we perceive is true or else would we not simply ignore it? If that premise of truth does not persist under the microscope of reason, do we not do ourselves and others a grave injustice by continuing as if it does? Is it not possible, as the Course states, there is nothing to forgive. What we discover, once we accept the absurdity of a life based on an illusory foundation, is a reality much more satisfying and certain than any found in the limited, contradictory, and uncertain world we have accepted for so long. Despite a long history of disease, violence, death, wars, and nightmarish epochs such as the Inquisition, we continue to accept our “reality” as our due; while at the same time expounding that it was created by a benevolent, loving Creator. I don’t blame this mess on God. I believe the world as we perceive it is a result of our own misguided perception and willingness to accept illusion as our reality. No perfect, loving God would deign to create divine offspring only to then let them live in such a world. I submit that God did create the world; only not the one we perceive and “validate” with our frail and unreliable senses. I believe He created a world so superior to what we normally experience we would be filled with joy at the mere sight of it. That world, my friends, exists. It has always existed and it will exist forever, whether we are aware of it or not. Yet once we do awaken and become aware of its truth, we will know beyond any doubt whatsoever, that it is the real world and that we have spent our lives dreaming a nightmare of our own construction. But rather than regret, we will know only of the all-encompassing Love our Beloved Creator has used to create the real world. I know this from A Course in Miracles. I know this from practicing forgiveness for twenty years, including the forgiveness of my son’s murderer. And I know this from having seen and touched that world. Nothing I can put into words can adequately describe of what I speak but know it is a promise made by God to His lost and errant children as they leave the dream of hate and come home to Him in Paradise. Is it not worth some small effort to consider the possibility of a divine life that exists now, and not just some abstract and distant promise of an artifact of mortal death? I look around at the material world and I see no reason to cling so fervently to it or the dismal existence that it offers. For me, I’ll bet my money on forgiveness, and God. to relay her personal journey through the lessons. Below is an excerpt taken from Robyn’s new book. It is August 2007. I have been studying the “Magnetic Laws of the Universe” for more than a decade. Acknowledging and implementing these unquestionable laws over all these years has indeed brought harmonious changes to my once questionable life. I was floored. 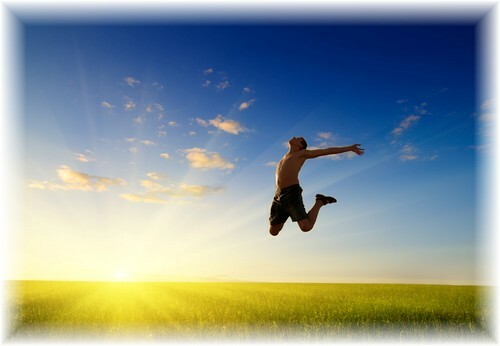 For many years, each time I visualized, I had received strong, encouraging, passionate feelings. It always felt like the right thing to do. Now, I was getting the message that this was no longer the right thing to do! After visualizing for so many years, I found it difficult to just stop. It had become a big part of my life. I also wasn’t completely sold on this new idea of not visualizing. So the next morning I sit to visualize once again. It didn’t take long, seconds maybe, before the same Inner Voice led me away from visualizing and gently guided me to hand all outcomes over to a Higher Knowing. Okay, I didn’t need any more convincing. This August day of 2007 would be the last day I would sit to visualize. I don’t feel this means that I don’t have a say in what I desire to see around me. After exploring the possibility of creation, I have come to understand that whatever I see and enjoy will continue to be. Or whatever I give little focus toward, or desire for, will cease to exist. I know this much: I am not going to walk around with my eyes closed. So, my ability to create a desired environment will continue to be based upon my enjoyment of my surroundings. I think this is the catch: Don’t control the outcome by placing emphasis on the outcome. It’s like the saying, “Let go, let God,” Or, “Jesus take the wheel.” I hand over the controls to my future, because I believe there is a Higher Knowing that knows better than me. Then as I move forward, I move in the direction that I am gently guided to, while enjoying whatever I choose to enjoy along the way. I feel that there can only be one reason why this change is occurring in my life. 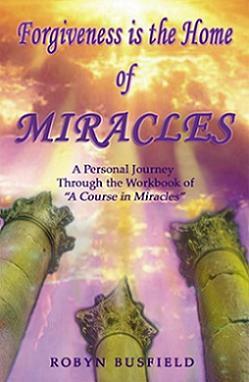 I have recently begun to study and practice the principles of a Text and Workbook called A Course in Miracles. A friend had given me this rather large and biblical looking book a few years earlier. At the time I read a little more than half the Text, each page at least four times over to assist in understanding this unique verbiage, and then placed this somewhat complicated book back upon the shelf. I am realizing that I must hand the steering wheel over if I am to have faith on my journey home. Also I am learning that Holy Spirit is my Inner Voice (Voice for God), as well as the Source of Higher Knowing, and will guide me as necessary on the path that leads me to peace, freedom, and love—thence God. So, now I move forward learning to have faith in releasing a lifetime of knowledge and trusting that Holy Spirit has eternal knowledge ready for me—the knowledge I once knew before I fell asleep. Today, I came across this excerpt from the Course which I found interesting: Yet the essential thing is learning that you do not know. Knowledge is power, and all power is of God. You who have tried to keep power for yourself have “lost” it. You still have the power, but you have interposed so much between it and your awareness of it that you cannot use it. [FIP Text, pg 296, 1.1; ACIM-OE Text CH 14, VII 58 pg 287] This confirms yet again that there is no use in me holding on to that steering wheel. I don’t know the way. And I surely don’t know the answers. Holy Spirit knows the way, and Holy Spirit has every answer ready for me to hear when I am ready to listen. If only I would let go of the steering wheel and trust Holy Spirit entirely…it is then that I will be reminded of my true power. ~ Urusla W & Sabine S.
The Holy Spirit is one of My favorite subjects, as It pertains to Who and What You really are. This particular Guidance has to do with learning more than just feeling uplifted as You read it. It is up to You to do the Joining and the Listening required. I’d like to start out with a little song that the Holy Spirit and I suggested to Sun~Rose for any trying time. It is sung to the tune of Gracious Spirit Dwell With Me, and it speaks the Truth of the Holy Spirit and All of You. Holy Spirit dwell as Me. I Myself am One as Thee. As Myself You do reveal. This song may also be sung with ‘We’ or ‘She’ or ‘He’ or ‘Thee’, depending on Who is needing not just healing, but Whole-ing. For the Holy Spirit is the Rest of You, without Whom You are incomplete. As You all have searched for eons for the ‘perfect (special) relationship’, it has truly always been the Holy Spirit You were seeking.What a joy to relax and find that out so that if You have a special relationship (or many of them), now Each of You can concentrate on the Holy Spirit and actually open the door to a Holy relationship. Not yet though!First You will learn the joy of re-acquaintance with the Holy Spirit, Your Self, a Self so lovely, so wonderful, so full of Life and Love and happiness, so gentle and so kind, that You will begin to understand what Love really is and that Love is what You are, Your very Substance, rather than the ‘material’ person You have thought Yourself to be. Let’s go back to the song, for those four lines can change Your old mindset about Yourself if You will allow it. “Holy Spirit dwell as Me”: Well, what does this mean? You aren’t asking here for the Holy Spirit to come into a material You – a human being – and be a part of You, thereby allowing You to continue holding on to Your so-called ‘human’ personality and opinions, et cetera, all the tools of the separation. This is not asking the Holy Spirit to dwell in You. It says: “Holy Spirit dwell as Me.” This is a humble, sincere request for the Holy Spirit to actually Be You, without reserving room for the personality, the entire persona You have created to separate You from God and the Rest of Yourself: the Holy Spirit. It is a request, an allowing for the Holy Spirit to Be You once again, the Real You, the You of God, rather than the little y you of the ego. You will notice that I always address You as the capital Y You of God, acknowledging both Our equality and Your Divinity. You have been hiding from Your Divinity so long that this may seem incomprehensible; yet Divine You are for You are of God. And the entire separation has been about denying and hiding that fact. The Holy Spirit is the Real of You, kept safe by God while You have played foolish, painful games for eons. You have hidden from the peace and joy of Reality, fruitlessly looking for these things in empty, painful dreams. The Holy Spirit has ever stood waiting for Your calls for help. “Holy Spirit dwell as Me.” ‘Holy Spirit I think I’m ready for You to take over, to Be Me. I’ve done such a terrible job, and I’m so tired. That realization and then request is the first step. For if You feel that You have some ‘life’ left in You yet, for being an ego, You will not give up control enough to remember to even consult the Holy Spirit regularly, much less moment by moment. If You will trust Me here, as Your Elder Brother, I will promise You that never will You find happiness from the ego mindset, for it is pure selfishness. And selfishness is misery for All of Us are One. And until the mind is changed from ‘Me’ to ‘We’ selfishness continues. Let Us go to the next line of the little song: “I Myself am One as Thee.” Notice again that it does not say “One with Thee” alloiwing You to retain the so-called ego identity. You are becoming willing, allowing Yourself to let the Holy Spirit Be You. I cannot say this too often: the Holy Spirit is not a tool for You to use when You are in trouble, when You need help, when everything’s a mess. Avoid the mess! Let the Holy Spirit Be You all the time. How do You do this? Well, I would like to blithely say: just make the choice and do it. And as Sun~Rose can tell You, the ego is more determined to keep control than You may have realized. She has been using the Gymboss little sequential timer that goes off with a buzz, automatically, almost 200 times before needing resetting. It is helping Her to remember to check in with Me and the Holy Spirit. While this may sound unnecessary to You, the point is: Do what works! And be committed. And trust whatever You are hearing in these small minute-by-minute instructions from the Holy Spirit, for here is where You are making a real connection in uniting in the minutiae of Your daily experience. Then, when a larger need arises, You will already be in practice and – most importantly – used to trusting what You’re hearing. As You are turning to the Holy Spirit asking what to say and do throughout Your day, You get the help and healing that You need. And it is most important to realize that the Voice that You are hearing is You – the Real You – the You of God. This is the whole aim of the Course: to bring You back into Your Right Mind. And the Holy Spirit is Your Right Mind. And the Love and Unity You feel brings such Peace and Happiness. She is also author of, “A Radiant Life: Raw Food and the Presence of Love“.